Daimler says it needs to build the C class in the U.S. to remain competitive. 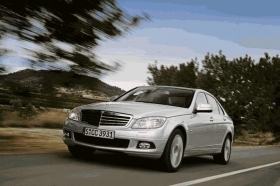 LOS ANGELES -- Mercedes-Benz will add production of C-class sedans to its plant near Tuscaloosa, Ala., starting in 2014. Daimler AG Chairman Dieter Zetsche, who participated in the creation of the Alabama plant project as a fast-rising executive in 1993, said in a statement released today from Stuttgart that the U.S. operation will take over about one-fifth of the model's global production. The Tuscaloosa plant currently is the source of Mercedes-Benz crossovers and SUVs, the M-class, R-class and GL. While the plant expanded several times to keep up with a seemingly insatiable world appetite for the large vehicles over the past decade, the crashing U.S. SUV market has left the plant underutilized for two years. “This applies not only to our direct production costs, but also to the import duty and logistics advantages,” he said in the statement. The likely addition of the C class has been rumored among Mercedes' suppliers since last year as the Alabama plant struggled with reduced volumes and staff reductions. Zetsche's statement said that moving C-class volume to the United States will require some shifting of products in Germany to protect jobs there. European C-class production from the Mercedes Sindelfingen plant will be consolidated at the company's plant in Bremen. Bremen will hand off assembly of the SL roadster to Sindelfingen. The statement, issued at 2 a.m. EST, was not clear on whether the moves would result in job cuts in Germany. It referred to the “remaining” 1,800 workers at Sindelfingen. “By means of alternative working arrangements, employees will be provided with a clear and stable outlook for the future. Daimler's personnel head Wilfried Porth told a telephone conference there would be no job cuts in Sindelfingen and that the company planned to add 1,000-1,200 jobs in the United States from 2014.